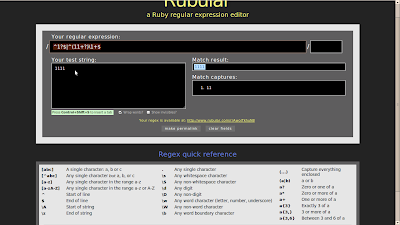 Last week i have written a post on prime numbers, later i found this blog using regular expression for checking prime number or not? To know more, first this method generates "11111" as per the argument value n (Ex:n=5). The first part is /^1?$ and matches with beginning ^ , an optional 1, 1? and then end of the string $, thus matches empty string or "1".If it matches then the number is not prime. The second part is ^(11+? )\1+$, first matches with the beginning of the string^, then begin first stored group (, then matches with "1" followed by one or more ones minimally 1+? and end storing the first group ).Then \1+ match with the first group, repeated one or more times.Finally $ end of the string. 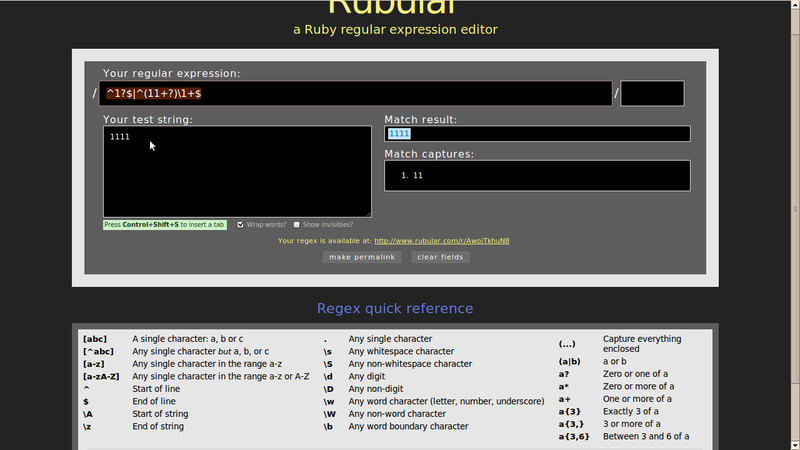 For more clear understanding, try to use the online rubular with reg exp.